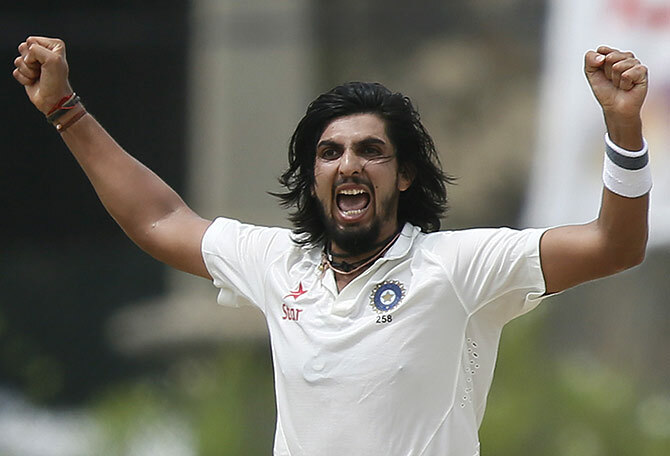 Ishant Sharma looked a cut above the rest on a docile track as Railways were reduced to 58 for five after Manan Sharma's maiden ton enabled Delhi tp reach 447 on the second day of a Ranji Trophy group A encounter, in New Delhi. In his fifth first class season for Delhi, left-handed Manan scored 136 off 216 balls and then took 2 for 18 in 11 overs with his accurate left-arm orthodox spin to put Delhi in the driver's seat. On a track where Railway pacers could hardly work up pace, Delhi skipper Ishant's very first delivery saw left-handed Saurabh Wakaskar (0) failing to get his bat down in time with his stumps rattled. Buoyed by his hundred, Manan then got the wickets of Arindam Ghosh (5) and Abhishek Yadav (1) with arm balls leaving Railways tottering by the end of the day. Manan, whose previous highest first-class score of 82, had strokes on all sides of the wicket. His footwork was assured and left a good number of deliveries outside the off-stump. But the moment he got half volleys, a drive was there for the taking. In all, he hit 17 boundaries and was finally holed out in the mid-off trying to loft left-arm medium pacer Deepak Bansal. Narang hung around as he hit six boundaries in his maiden half century to take Delhi closer to the 450-run mark before being the last man to be dismissed. Mysuru: Centuries by opener Ravikumar Samarth and Krishnappa Gowtham helped Karnataka reach 427 for 6 and secure a 282-run lead at the end of day two in the Ranji Trophy Group A match against Assam. At close of play, Gowtham was batting on 147 while Shreyas Gopal was on 38. Assam was bowled out for 145 in 59.1 overs on the opening day on Saturday. Gowtham hammered 10 boundaries and six sixes in his 158-ball knock and was involved in century stands with Stuart Binny and Shreyas Gopal. Samarth made a well-compiled 123 in 234 balls, studded with 10 boundaries. Assam fought back in the truncated morning session with Arup Das taking two wickets in an over. Resuming at the overnight score of 77 for no loss, the total had reached 92 when Mayank Agarwal (31) was dismissed by Arup Das. Abhishek Reddy was out off the next delivery for a duck. Samarth, who was batting on 75 at lunch, reached his century in the post-lunch session, steadied the ship in the company of Mir Kaunain Abbas. However, the visitors checked Karnataka's progress with wickets of Samarath, Abbas (30) and Chidambaram Gautam (0) in quick time. K Gowtham, in the company of Stuart Binny, stepped up to frustrate Assam. They added 103 runs for the sixth wicket before Binny was castled by Das soon after tea. Purkayastha and Das picked three wickets each, but rest of the bowlers were off-colour, to add to Assam's woes. Brief scores:Assam 145 in 59.1 overs (Gokul Sharma 55, K Gowtham 4 for 20, Shreyas Gopal 3 for 43) vs Karnataka 427 for 6 in 115 overs (K Gowtham 147 batting, Ravikumar Samarth 123, Swarupam Purkayastha 3 for 80). Rajkot: Out-of-favour Ravindra Jadeja struck a timely double century while slow left-arm spinner Dharmendra Jadeja picked up three wickets as Saurashtra reduced Jammu and Kashmir to 103/4 in their first innings in reply to 624/7 declared in a Ranji Trophy Group B match. Resuming at an overnight score 428 for four, Saurashtra added another 196 runs with the loss of three more wickets before declaring their innings. Both overnight batsmen Jadeja and Snell Patel added 51 and 53 runs respectively to their overnight score. Jadeja made 201 runs off 313 balls with the help of 23 fours and two sixes, while Patel faced 167 balls for his 94 that was studded with 14 hits to the fence. Chirag Jani (21) and Dharmendra Jadeja (40) were two not out batsmen when skipper Cheteshwar Pujara declared the innings. For Jammu and Kashmir Ahmed Bandey (25) and Shubham Khajuria (41) started cautiously, putting on 50 runs for the opening wicket. However Dharmendra Jadeja struck thrice, removing Bandey, Pranav Gupta (0) and Ian Dev Singh (6) to reduce Jammu and Kshmir to to 67 for three. Ravindra Jadeja removed Khajuria in the last over of the day as the visitors are still trailing Saurashtra by 521 runs. Skipper Parveez Rasool (23) was at the crease when stumps were drawn. Dharmendra Jadeja was the pick of the bowlers for Saurashtra, picking up three wickets for 36 runs, while Ravindra Jadeja took one wicket giving away 20 runs. Brief Score: Saurashta 624 for 7 decl in 135 overs (Ravindra Jadeja 201, Sheldon Jackson 181, Snell Patel 94; Waseem Raza 3/164) vs Jammu and Kashmir 103 for 4 in 46.5 overs (Shubham Khajuria 41, Parveez Rasool 23 not out; Dharmendra Jadeja 3/36). At Nadiad: Kerala 208 all out in 66.5 overs vs Gujarat 307 for 9 in 106 overs (Chirag Gandhi 91 not out, Samit Gohel 69; MD Nidheesh 3/58). At Jaipur: Rajasthan 423 all out in 141.5 overs (Tajinder Singh 134 Amit Kumar Gautam 107; Sunny Gupta 3/76) vs Jharkhand 97 for two in 31 overs (Saurabh Tiwary 56 not out; Aniket Choudhary 1/16). Chennai: M S Washington Sundar's brilliant, unbeaten 156 and his big opening partnership with skipper Abhinav Mukund (76) helped Tamil Nadu seize the initiative on the second day of the Ranji Trophy Group C match against Tripura. Tamil Nadu ended the day at 332 for 2, a lead of 74 runs in response to Tripura's 258 riding on Sundar's maiden first-class ton which included 14 fours and one six. He has batted for 223 balls so far. Washington Sundar opened for Tamil Nadu in place of Murali Vijay, who is sitting out the game due to a neck spasm. Baba Indrajith, who has so far added 152 runs with the young southpaw (Sundar) for the third wicket, is batting on 73 (six fours). Earlier, the home team wrapped up the Tripura innings for the addition of just 14 runs to the overnight score of 244 for 7. K Vignesh took two of the three wickets to fall to finish with four for 41. R Ashwin got the other to finish with two wickets for 64. It took all of 6.1 overs for TN to polish off the visitors' tail. Tamil Nadu began their reply in a positive manner with Mukund and the young Sundar scoring briskly. The two left-handers took the attack to the Tripura bowlers and took advantage of some pedestrian bowling. Mukund hit 10 fours in his knock of 76 and added 162 runs with Sundar. While the TN captain played some beautiful shots on the off-sider, the lanky Sundar blossomed after a cautious start and hit strokes around the wicket. The two openers went on the offensive in the post-lunch session and at one point hammered 32 runs in three overs. Sundar hammered Tripura skipper Mani Shankar Mura Singh for three boundaries in one over. Just when it appeared that the two southpaws would carve out big individual scores, Mukund fell to a catch by Gurinder Singh in the point region off Joydeep Bhattacharjee, making his debut. M Kaushik Gandhi, who had a great run in the previous season, didn't last too long, being trapped leg-before by Gurinder Singh for 9. Sundar and Indrajith continued to make light of the inconsistent Tripura attack and put on 152 runs in 216 balls to put the home team in the driving seat. Indrajith batted efficiently and proved the perfect foil for Sundar, who was constantly on the lookout for runs. Mura Singh told reporters at the end of the day that the bowlers were inconsistent and admitted that Tamil Nadu batted well. Brief scores: Tripura 258 all out (Smit Patel 99, K Vignesh 4 for 31) vs Tamil Nadu 332 for 2 in 81 overs (M S Washington Sundar 156 batting, Abhinav Mukund 76, Baba Indrjith 73 batting). At Vadodara: Baroda 373 all out in 128 overs (Swapnil Singh 88, A Sheth 70 not out, Vishnu Solanki 61, B Ayyappa 4 for 69) vs Andhra Pradesh 190 for 2 in 46 overs (G Hanuma Vihari 71 batting, Ricky Bhui 53 batting, K S Bharat 40). At Indore: Madhya Pradesh 409 in 144.3 overs (Naman Ojha 180, Ankit Sharma 67, Akash Parkar 4 for 70) vs Mumbai 130 for 1 in 33 overs (Jay Bista 89 batting). Raipur: Pacers Mohammed Shami and Ashoke Dinda blew away the Chattisgarh top-order with incisive spells after Bengal scored a mammoth 529 for 7 on the second day of the Ranji Trophy group D encounter. Courtesy Sudeep Chatterjee's (118) second hundred in as many games along with veteran Anushtup Majundar's quickfire (70 off 88 balls), Bengal managed to surpass 500-run mark in their second successive game of the season. With a cushion of runs under their belt, Chattisgarh were reduced to 80 for 5 with Shami (2/33 in 9 overs) and Dinda (2/6 in 6 overs) rattling the mionnows with pace and swing. Earlier, Chatterjee scored his 10th hundred and also completed 3000 runs in first-class cricket in his 43rd game. His 118 off 191 balls had 12 boundaries before he was trapped leg before by Shubham Singh. Skipper Manoj Tiwary (36) and Wriddhiman Saha (27) also did not score too many but Anushtup in company of B Amit (50, 66 balls) added 120 runs in 25.2 overs before Tiwary decided to have a go at the home team for 31 overs. 1) Bengal 1st Innings 529/7 (Koushik Ghosh 114, Sudeep Chatterjee 118, Abhishek Raman 94, Anushtup Majumdar 70) vs Chattisgarh 80/5 (Mohd Shami 2/33, Ashoke Dinda 2/6. 3) Goa 255 vs Himachal Pradesh 356/4 (Ankush Bains 143, Priyanshu Khanduri 117).